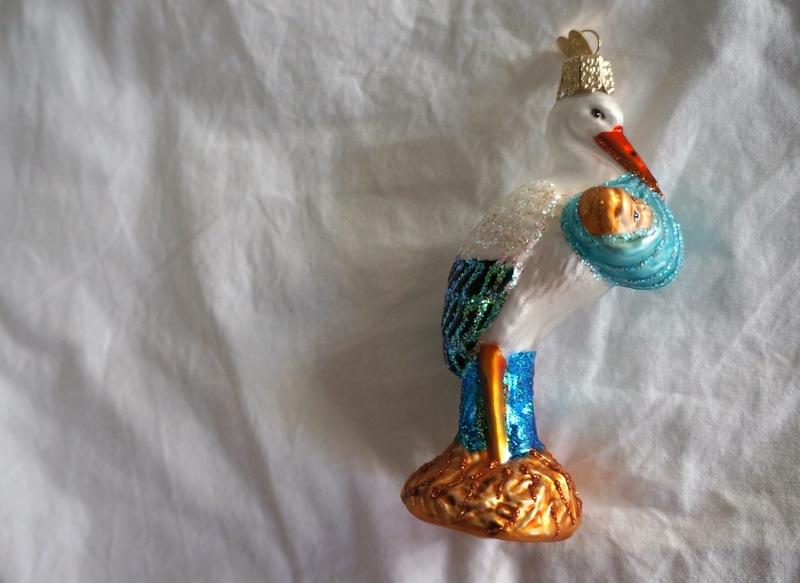 Monday Edu came home with 100% new-mummy crowd pleasers; a stack of design, fashion, and trash magazines (of which until today I've managed to flick through a whole 20 pages...), and this beautiful mercury glass Christmas tree ornament for our first baby; stork holding a baby boy. I almost cried. For those who know me, I have a have quite an obsession with mercury glass ornaments. I first discovered mercury glass when living in Northampton, Massachusetts, in 2000. We didn't have them growing up in Australia (or not that I ever saw). There were a few antique shops in Northamption, and when I came across these ornaments for a mere $0.25 – $2 a piece, I couldn't resist. So began my love affair, and it's still going strong. Now I have a lot (a LOT), from pine cones, Santa's, snowmen, animals, birds, toys, robots, and basically anything else you can think of, as well as the classic round balls. If you're looking for beautiful ornaments; Fortnum and Mason in London have a lovely (though very expensive...) range, as do Liberty's of London (also not cheap). In Amsterdam; de Bijenkorf have a decent range, and home boutiques will stock them also. I cannot wait to get a tree and start decking out the house is all it's Christmas glory. Bring on the silly season! !